How to view API details on the Publisher Dashboard of an Azure API Management Service? 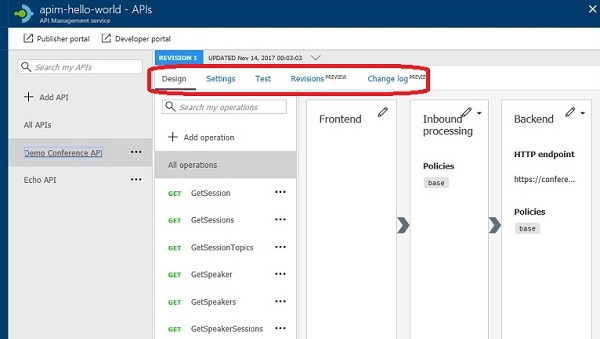 You can follow this tutorial to view detailed information of API on the Publisher Dashboard of an Azure API Management Service. Design - Allows you to add, view, and change operations of this API. And allows you to manage processing logics common to all operations. Settings - Allows you to view and change settings of this API. Test - Allows you to run tests of a given API operation. Revisions - Allows you to manage revisions of this API. Change log - Displays change history.